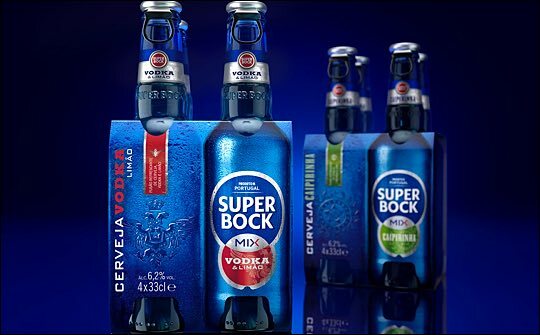 Unicer Bebidas, part of the Carlsberg Group and Portugal’s largest brewery, has parnered JDO Brand Design & Innovation to launch a range of premium spirit flavoured beers under the Super Bock brand. Established in 1927, Super Bock claims to be the only beer brand to win 32 consecutive gold medals and is the market leader in the beer category in Portugal. 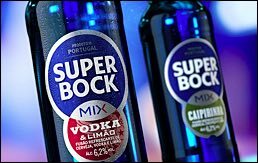 With the rise in popularity of cocktails and spirit based drinks, Unicer Bebidas saw an opportunity to bring the Super Bock brand to a new generation by launching a range of beer and spirit ready to drink mixes. The two blends that have been created – vodka lemon and Caipirinha – create a unique taste experience of Russia and Brazil. JDO was briefed to create a new range design capturing the refreshing taste of Super Bock beer with an expert blend of high quality spirits. The blue glass bottle takes the brand into a more youthful club territory while allowing the quality of the beer to shine through. The striking range colour palette of deep blue and satin silver to convey sophisticated refreshment cues contrasting with the spirit variant colours that deliver both a premium and fresh feel. The mix logo has been styled as a contemporary X graphic device bringing the two categories together. This idea is further developed with interlocking circles that illustrate the perfect fusion of beer and spirit, while the individual craftsmanship, detail and refinement of each premium spirit is reflected by characterful typography. The range is set to launch in Portugal in both the on and off trade this month.